WQI is a forestry industry based research company with the objective of developing tools and techniques to better assess wood quality to drive better allocation decisions along the supply chain (e.g. the right logs or timber going into the right process or end-use) and improving processing methods and technology (e.g. how do we minimise the damaging effect of checking and cell collapse during timber drying). WQI's shareholders are forest industry participants (mainly based in NZ and Australia). As a WQI shareholder, PF Olsen gets direct and immediate access to share-holder privileged research findings which we can then apply to the management of our client's forest and harvesting management. 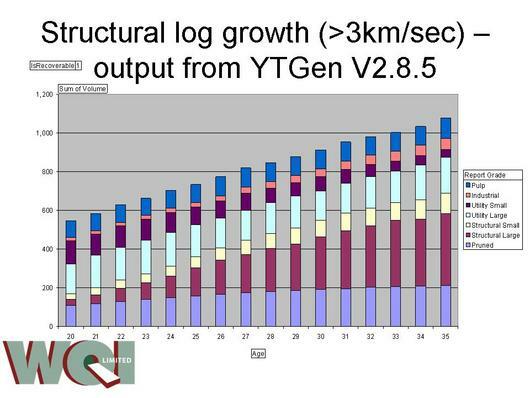 One exclusive benefit that came out of WQI this year was the development of algorithms that enabled us to estimate wood density and sonic velocity (wood stiffness) for individual log sorts. We could also model the changes going forward as a function of forest growth. This allows us to accurately determine the year at which production of high value structural logs optimised the total net return from harvesting. This ultimately means more money for the forest owner. The chart (below) shows such a projection for a stand in the Bay of Plenty. Two of the great advantages of WQI is its funding leverage and collective effort. For each dollar invested by the shareholder, the Government contributes a dollar. This funding leverage gives a real boost the research programme and acts as an incentive for shareholders to get stuck in and provide good funding support. Most of the research programmes would be out of the reach of individual shareholders. Collectively, however, the research funding is significant and allows WQI to manage programmes of real substance with significant value-added potential. A current exciting area of research with a big near-term potential win is the development of tools for predicting resinous defects at the forest and stand level. The particular relevance of this research relates to the critical role exported Radiata pine appearance products will play in utilising the large volumes of pruned logs coming on stream over the next 10 years. 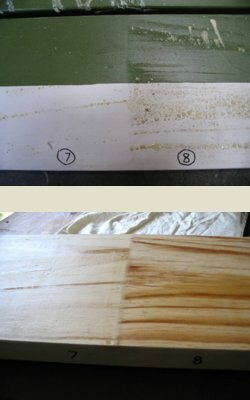 The photos (right) show resin bleed; the top photo through paint (this is from a barge board - the green section being exposed and the white section was underneath the roof flashing) and the bottom photo after machining. The section that has bleed is clearly different from the section of wood it is finger-jointed to. WQI is working on developing an automated system to allow processors to reject these pieces before manufactured into final product. This will confer huge cost savings by reducing the incidence of non-conforming product.